IBM Mid Market supports a large partner network of several thousand providers that deliver systems and solutions to their clients and utilise IBM technology and expertise as part of the solution offering. The most difficult part of the sales process for partners is educating their prospective clients in subjects that are inherently complex in nature so the prospect can get to the buying stage easily. 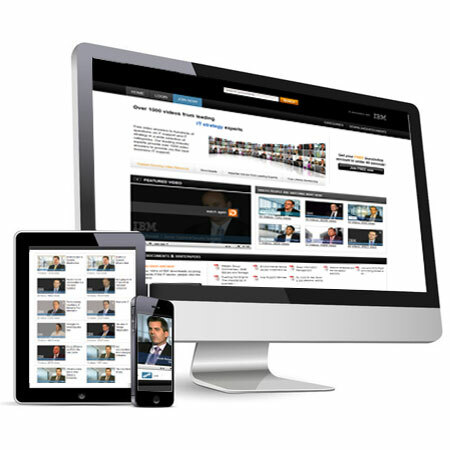 Based on the success of our own learning video platform, GuruOnline.tv, Logicc was approached and subsequently commissioned by IBM to create a bespoke video portal that would deliver ‘bite-size chunks’ of information presented by various members of the partner network to develop new contacts that could then be carefully nurtured and education by careful follow up activities. Mid-market decision makers are notoriously difficult to get to, on top of this the high-technology solutions of IBM and its partners give an even large challenge in terms of custom engagement. IBM have a tried & tested ‘nurturing’ program that develops new prospects in a controlled and measured fashion but as with all sales operations the challenge is getting the new contacts to become part of that process. Our digital marketing division worked closely for 3 years with IBM’s Midmarket team and its partner network to film and publish over 4000 video clips in a very simple Q&A format which was then heavily promoted via social, search and traditional marketing channels to deliver not only a new stream of contacts to start IBM’s nurturing process, but also to position the participating partners as ‘thought leaders’ in their particular area of expertise. The solution was to create an IT Channel on the GuruOnline.tv brand to position IBM and its partners in a high profile, 3rd-party endorsed light that ensured viewers were exposed to small chunks of knowledge very quickly and easily. This resulted in large scale exposure for IBM partners (and internal IBM experts), many whitepaper downloads and hundreds of thousands of views of the partners’ video content. The IT Channel content was sold to IBM in 2011, it is still in widespread use across the world today.